The tablet scoop used for this activity dictates an awkward wrist posture. It also requires the arm to be raised above shoulder height because of the high position of the tablet hopper. 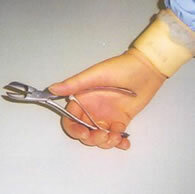 Using these pincers creates a pressure point in the palm of the hand. They also require a forceful grip to operate them. Alter position of the work object e.g. bring it closer. 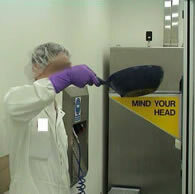 Also consider the suitability of PPE, ensuring that it does not interfere with dexterity or movement. Psychosocial factors may also influence the likelihood of problems developing and need to be taken into account. Psychosocial risk factors are things that may affect workers psychological response to their work and workplace conditions (including working relationships with supervisors and colleagues). Tasks requiring high levels of concentration for long periods of time. Many tasks within pharmaceuticals manufacture or research and development can possess these risk factors.